At the time of this article there are only four 450Mbps wireless adapters. To make matters worse three of them are Mini pci-e. We have good news though. TRENDnet, one of the two manufacturers making 450Mbps routers were kind enough to release this adapter to utilize the full 450 Mbps speed on any device with an RJ-45 Ethernet port. 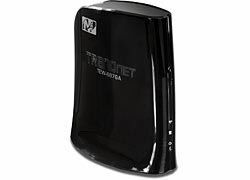 TRENDnet’s 450Mbps Wireless N Gaming Adapter, model TEW-687GA, networks gaming consoles, televisions, and DVRs to the Internet with an ultra-high performance 450Mbps wireless connection. Setup is quick and simple, with no drivers to install and a Gigabit Ethernet port transfers wired data fast. Advanced Multiple Input Multiple Output (MIMO) antenna technology with three spatial streams per antenna generates a maximum theoretical wireless throughput of 450Mbps. Connect to a router at the touch of a button with Wi-Fi Protected Setup (WPS). WMM® Quality of Service (QoS) technology prioritizes gaming, Internet calls, and video streams. LEDs on the front of the adapter convey device status. Cut your cables and start winning with ultra-high performance 450Mbps wireless n.
According to TRENDnet this device has some of the same features as a router should. So if you are using this with a router that is less than full featured you can compensate with the settings on this device. Lets take a closer look.